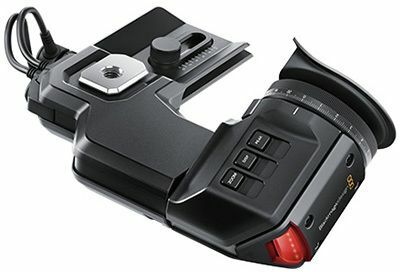 If you’re project calls for a lot of over the shoulder or handheld shooting, you’ll want to add the Blackmagic URSA Viewfinder. You get a high resolution 1920 x 1080 color display that lets you get incredibly accurate focus and the screen is so sharp that it’s impossible to see any individual pixels so it’s just like using an optical viewfinder on a traditional film camera. The viewfinder can be adjusted for either left or right eye use. Simply plug it into the power and SDI viewfinder output, then start shooting! The viewfinder features a sensor that turns off the screen when you’re not using it to save power and extend the life of the OLED screen.